The HTC Desire 820 is a typical member of the manufacturer's mid-range lineup. It bears all of the characteristic design features for the family - a two-tone unibody plastic shell, complete with particular color accents and an oversized camera lens on the back. The handset is surprisingly thin, measuring 157.7x78.74x7.74mm and also pretty light for its size at 155g. The Desire 820 is shaping up as a successor to the popular HTC Desire 816. The display is identical - a 5.5-inch 1280 x 720px Super LCD2. The front-facing BoomSound speakers are still present, which is definitely great news. The 13MP main camera is identical (at least on paper), while the front-facing shooter has been bumped-up to 8MP. Other hardware improvements in the Desire 820 include a 64-bit Snapdragon 615 chipset with an octa-core Cortex-A53, 2GB of RAM and an Adreno 405 GPU. The HTC Desire 820 has a lot going for it as a solid mid-range device. It pretty much delivers everything that it promises - good camera quality for both shooters, solid sound and 4G LTE connectivity. 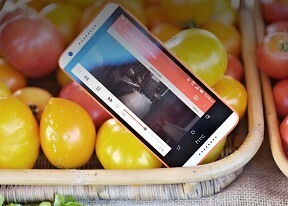 The spirit of the Desire 816 is still pretty much present, but HTC has put a lot of effort into improving the phone in several departments. The button placement is a lot more convenient and the Desire 820 seems to offer a more polished experience as a whole. The smartphone market seems to be shifting its focus more on mid-range devices that are stepping in as the new driving force, especially in emerging Asian markets. HTC has definitely caught that tendency and is putting a lot of effort into its more budget-oriented devices. But can the HTC Desire 820 live up to the popularity of its predecessor and satisfy cost-conscious consumer needs in an ever growing and increasingly dynamic smartphone market? Follow us to the next pages for our two cents on the matter.